My so-called life has a wonderful heart, as she never fails to include me into the appreciation she did into her fellow bloggers. I do admit her being nice and sweet. Thanks a lot Te Lynn, definitely love it. I know this is an overdue, forgive me and now here it is..
hello sis i was here on a wednesday! have a nice day! thank u for posting this, sis. more coming soon. hehe. Wow! 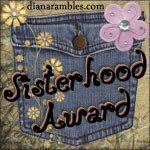 this award is cute and it soothes to your personality for me because you're such a darling.